Scurvy is a condition caused due to the deficiency of vitamin C in the diet. Vitamin C is a vital necessity for the synthesis of collagen. Lack of this vitamin causes dehydration, ulcers, and exhaustion. 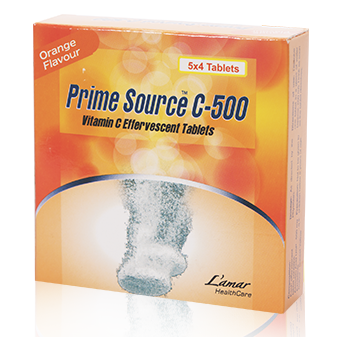 Prime Source C-500, a vitamin C rich effervescent tablet used as a supplement to prevent the individual from being dehydrated. Available in an orange flavour to enjoy your drink. Vitamin C - 500 is an oral solution taken as a supplement, which is rich in mineral salts and electrolytes, to refresh, revive and reenergize your body. Take the vitamin C effervescent tablet orally. Place the tablet in a glass of water (150 to 200ml), allow it to dissolve and drink it all. Do not chew the tablet.